← What’s coming up soon! 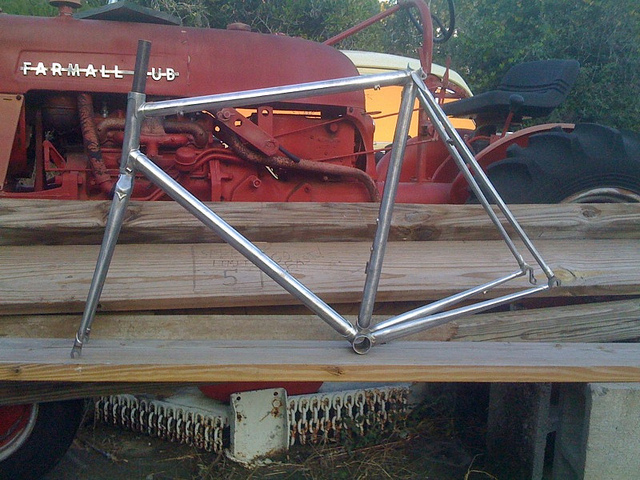 The 2nd best part occurs when the frame is done. There is a point after both triangles are brazed together and the frame looks like a frame that feels like a 2nd beginning. In a job shop maybe this is where the frame gets passed off to a very junior person. The braze-ons, finish filing, reaming, facing and 10 other things make this step the longest for me. It’s dirty, tedious and begs for great tunes blaring from the eyephone. But it leads to the 2nd best part, where I pass the frame off to the painter. Ok, yes I’m the painter, but it does provide for a mental break and a sense of completion. It’s also the start of the steps to get to the best part…..Delivery. ps, I’ll be fixing the farmall this week if your asking. Looks like it would fit me perfectly.